Comecer solutions for Bulk API Powder Aseptic Handling and Filling in Pharma are compatible with all different types of containers. An ISOLATOR is a barrier systems well defined (physical) that can be validated to provide significant risk reduction of bio-contamination. An isolator provides an uncompromised, continuos, Grade A isolation of its interior from the surronding environment. A RABS is a combinations of physical and aerodynamic barrier over the aseptic process zone. RABS is an alternative contamination control methodology designed to be used in a higher classification cleanroom (EU Grade B – ISO 7 minimum) and based on systems of less engineering complexity. Why Comecer prefers the isolator? Given the complete separation between the operators and the aseptic area, the isolator solution is more likely implemented together with a certain level of automation when the batch sizes are significant. Same when the API has in some extent containment need the solution with isolator is a must. On the other hand RABs can be adopted when an extremely manual operation is carried out and no issue of containment is involved. 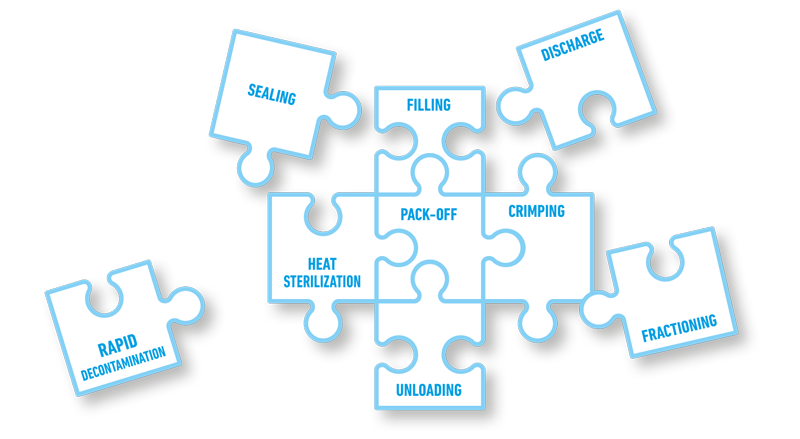 All the Bulk Sterile processes have many aspects in common, however every applications has its own specific requirements and constraints. For this reason Comecer re-designs the system configuration ad hoc integrating newly conceived solutions to already adopted functional modules.